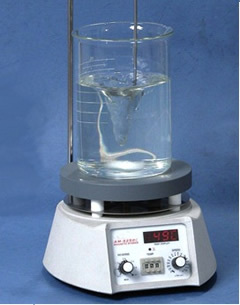 This group of magnetic stirrers is similar to the conventional magnetic stirrers but have additional hot plate to achieve heating of solutions to be stirred. The heat is controlled by energy regulator, which ensures regulation at any desired percentage of the capacity of heater. The system runs at a fixed speed (factory preset at the optimal setting). Items that can be tampered with and may slow production, such as buttons, dials or switches, have been eliminated. It has a compact stirring device utilizing a rotating magnetic field (created by a PERMANENT MAGNET) which induces variable speed stirring action. Stirring is accomplished by means of small tefflon rotor, which when placed in the liquid to be stirred is capable of rotation by magnetic field applied from below the container. The unit is fitted with pilot lamp. To work on 220/230 Volts A.C.
2. Exact temperature and speed setting via digital display. 3. Set safety temperature limit displayed digitally. 4. Hot Top indicator >> hot surface warning to prevent burns. 5. Digital error code display. 6. With adjustable safety circuit of heating plate temperature (50 - 360 °C). 7. Safety magnetic stirrer with heating, suitable for unsupervised operation. 8. Bushing according to DIN 12878 for connecting a contact thermometer, e.g. ETS-D5, enables precise temperature control. 9. High level of safety thanks to improved heat control technology. 10. Enclosed assembly (IP 42) guarantees long service life. 11. Highly polished aluminum heating plate for optimum heat transfer.